There comes a time, in every girl’s life, when she must go to places that polite people don’t talk about at dinner parties. In Doha, one of those places is Paloma. The blurb says “where Texas meets Mexico”. It’s more like “Where Drunk People Meet More Drunk People”. Before 8pm, it’s a somewhat decent Tex Mex Restaurant. After then, when the hotpants-wearing Columbian band takes the stage, it becomes something different. I was there to celebrate a friend’s birthday and perversely because I had never been. And because we also had a coupon. The menu stretches the full gamut of tacos, enchiladas and some good looking fajitas. Spotting the opportunity for a post, I ordered the World’s Biggest Margarita (it was in a Guinness glass…discuss) and the nachos carnita. 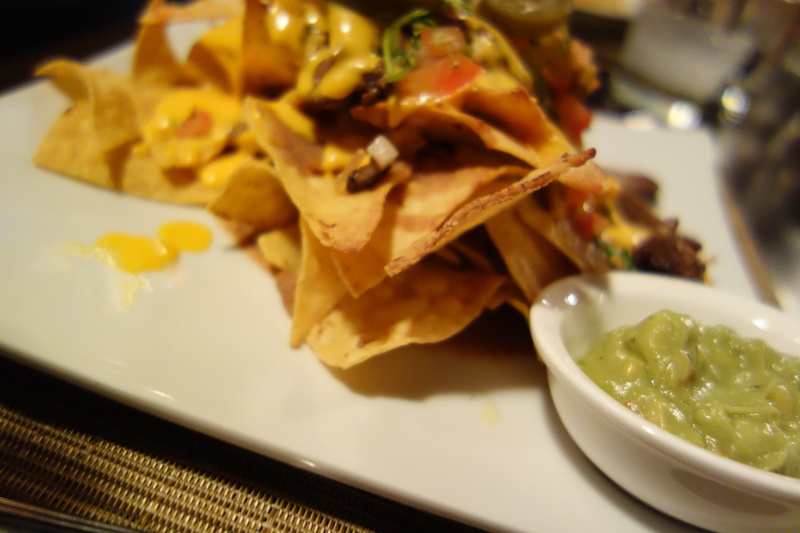 Nachos have a place in my heart (and my arteries probably). 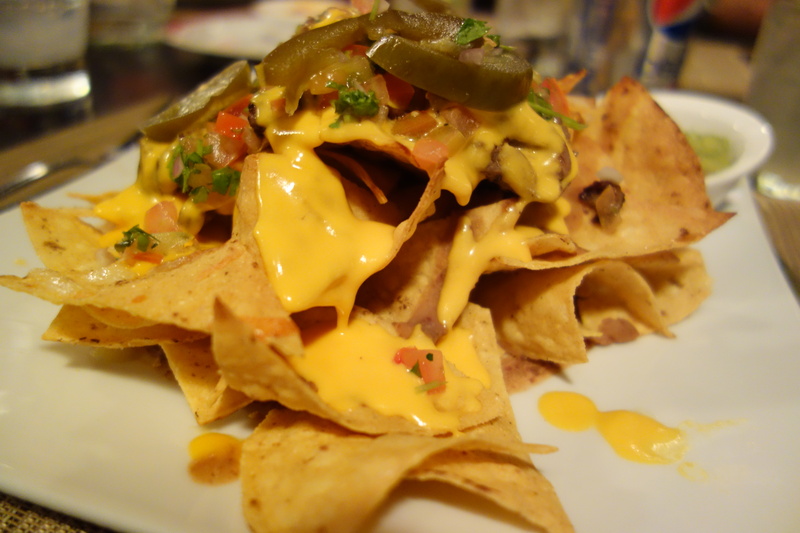 In their simplest form, nachos are tortilla chips (totopos) covered in nacho cheese or shredded cheese and/or salsa. First created circa 1943 by Ignacio “Nacho” Anaya, the original nachos consisted of fried corn tortillas covered with melted cheddar cheese and sliced jalapeño peppers. he has a lot to answer for. When mine arrived, with its slivers of actually tasty beef and melted cheese, I asked the Sri Lankan (the irony of a Sri Lankan waiter serving me in a Mexican bar in Doha is not lost) what kind of cheese it was. He stared at me blankly and said “melted”. I think it was cheddar. It could have been Nacho Cheese which “has no legal definition beyond the generic legal definition for cheese products established by the U.S. Food and Drug Administration”. That said…it was tasty, washed down with the strongest margarita I have ever had, it was pretty good. The service was great, the atmosphere lively and the bill manageable. The food here is decent, people at our table were full and happy. I’m not sure where the men at the next table told their lady friends they were going, but they looked like they were dressed for a night at a Michelin Star restaurant. Yes. Really. I left not long after the band took the stage and started regaling the mainly male clientele with “Killing Me Softly” in Spanish. It was for the best.